your own water park to match your lifestyle and landscape. Building Memories for a Lifetime! Imagine a beautiful vacation spot with an inviting swimming pool that is only a few steps out the backdoor of your house? The options are unlimited, from Carribean colors to deep ocean colors; custom shapes and sizes to custom designed pool stair entires; and kuddle koves, or waterfalls, water spouts or other special water features and pool lighting. Let us help you create that perfect pool for your family to relax, recoup, and make memories. Or add a water slide to make your backyard a private waterpark. While you are building your dream remember you can include options like custom pool decks of stamped concrete in popular patterns like flagstone, slate or brick. Additional patio space is another popular option. See Your Pool Before We Build It! Here at Swim Shack Inc. we know it isn't easy to know what your dream in ground swimming pool will look like before you invest. That is why we offer you the opportunity to see the way your pool will look in your backyard, before we build it. Using 3D design, this additional service allows you to see your new inground swimming pool from the patio, the house, above the pool and even in the pool! 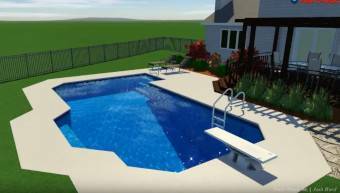 Take a look at some of the 3D pool videos of pools we've built. Call Swim Shack Inc. (630) 466-4853 for details on this special value added service. We can make your dreams a reality with a beautiful, custom designed swimming pool. Swim Shack works hard to make sure you get exactly the look you desire with a quality that surpasses your expectations. We offer turn-key design and swimming pool construction services. You can now select a chlorine free pools. Swim Shack Inc. is just the company for you. Welcome to the "GOOD LIFE". Swim Shack, Inc. has been turning family dreams into reality for over 40 years, since 1978. We combine years of experience and knowledge with personal touch to create your own private backyard swimming paradise. Swim Shack, Inc. is a family owned and operated business, serving the Fox Valley area of northern Illinois, designing and building custom inground swimming pools for more than 40 years. Financing Your Pool Just Got Simpler. Swim Shack Inc. is a dealer for Paramount Pool and Spa Systems. Because we are an approved authorized Paramount pool builder you can take adavantage of Paramount Capital's services to help you turn you dream pool into reality. Click on the logo to watch a brief video and get started. We are a full swimming pool service company that can take care of all your pool needs. 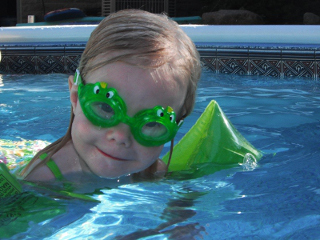 Swim Shack features quality Hayward® Pool Products. As a Totally Hayward™ Partner, we will properly size and install your new pool heater, pump or filter. When you are ready for the convience of an automatic pool cover, we can handle that too. Whether you're in the market for a custom inground pool, a replacement vinyl swimming pool liner, swimming pool service work, a new swimming pool heater, pool pump or pool chemicals, you'll find all you need at Swim Shack Inc. Swim Shack is a swimming pool contractor you can trust. So dive in and swim through our pages and see what we have to offer you! Be sure to let us know how we can help you start on your backyard dream custom inground swimming pool. Get in the swim. You'll see our swimming pool service trucks this summer through out the Fox River Valley in communities like St. Charles, Geneva, Batavia, Oswego, Naperville, Yorkville, Plainfield, North Aurora, Illinois and beyond. Call Swim Shack at (630) 466-4853.